Our first Caregiver University of the year is happening next Friday in Belpre, OH. Over the next three months we will host Caregiver University events across the state. Caregiver University is a one-day mini-conference for family and professional caregivers. This year will mark the third year for Caregiver University, we've seen tremendous success over the past two years and look forward to really successful events this year! Since this is the third year for Caregiver University, we looked back at our previous two years of feedback from participants and made a number of tweaks and changes. Namely incorporating more time for discussion, questions and activities. This workshop will incorporate your challenges as a caregiver with meaningful discussion and interactive activities to practice the easy to implement communication techniques. This workshop will address challenging behaviors, bridging the communication gap with your loved one, and how to incorporate activities into your daily routine. Back by popular demand Senior Legal Aid's Cat McConnell will walk us through the maze of legal and financial issues you may face as a caregiver. Her easy to understand advice makes these complex issues a little less daunting. Our Ohio CU events will feature one of the most well respected elder attorneys in the Mid Ohio Valley region, and even the state, Gerald Townsend. We appreciate both of their time and dedication to Caregiver University. A number of our events will once again feature Dr. Shirley Nietch and the Caregiver Cafe. He practical advice to coping with your family through caregiving is a session you don't want to miss. Dr. Nietch links you with not only practical caregiving advice, but how to de-stress and resources to help you through your journey. This is a new addition to Caregiver University and will be featured at Belpre, OH; Romney, WV; and Bridgeport, WV. The focus of this workshop is looking at the transitions in care that often accompany Alzheimer's and dementia. From home to long term care or hospice, this workshop will give you the tools to plan for the future. Wandering, driving, hospitalization, kitchen appliances, family valuables - the symptoms of Alzheimer's disease increase safety risks for persons with the disease and those who care for them. But, when you plan ahead you will be able to better cope when incidents happen. You will leave this interactive workshop with plans to cope with a variety of potential safety concerns. You can find a Caregiver University near you AND register by following this link. In our activities training we talk about how even the simplest of activities can activate memories from the brain. Often cooking is one of those every day activities that can be a great reminiscing activity with your loved one. From smell, to taste to touch and the physical actions can trigger favorite memories. 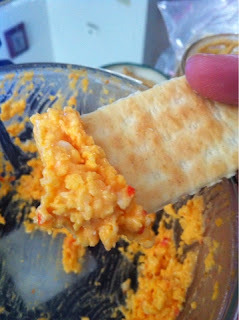 Classic recipes, like pimento cheese, are perfect for these type of reminiscing activities. One of my earliest memories of my dad is his love of pimento cheese. For some awful reason I HATED pimento cheese as a child, but lately my mom has been whipping up a homemade version that I can't get enough of. 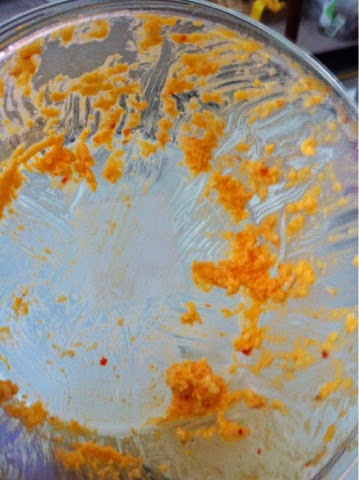 So, when we were grocery shopping for our Mac&Cheese Cook off supplies last week, I got the cheese bug and whipped up the best tasting pimento cheese on the planet! Side bar: Yes! Mac&Cheese cookoff! We really love food at our office and jumped at the chance to support the Childhood Language Center here in Charleston. Our team was featured this week in the Charleston Daily Mail! BUT, the cookoff isn't until Saturday - so stay tuned for our winning Mac&Cheese recipe next week! Back to the pimento cheese! Directions: Dump into food processor and blend! We determined it was tasty with the pretzel chips, but they were too breakable. Old fashion club crackers won out on the taste testing, second to bagel chips! So easy, so homemade, a true walk down memory lane!